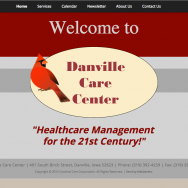 The kind folks at Danville Care Center wanted a website designed to reflect the look of their current marketing materials. I created a site with their unique look and styling, but made sure the result was easy to maintain and administer. WordPress was the perfect answer to this challenge, as it allows clients to add, remove, and change content on the site without having to wade through code to do so. This website is flexible enough to be a long-term solution for Danville Care Center and will be able to grow with them.